Looking for genealogy information on the Hanley family who lived in Beechmount Parade in 1960. 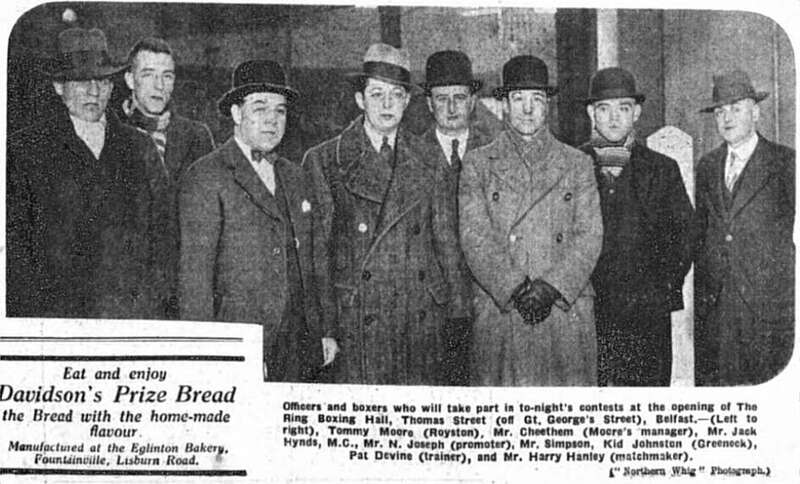 Harry Hanley was a boxing promoter and on the management of Celtic Park dog track. born around 1895 in Dublin. Many thanks for your kind response. You are correct - he was born at Usher's Quay in Dublin. In 1922 he married Elizabeth McConkey in St Malachy's in Belfast. They lived at 91, Beechmount Parade Belfast in 1960. 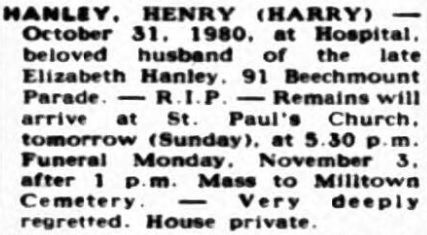 I hope to discover when Harry Hanley died and if he had family. I have plenty of information on his Dublin Family. Well you nailed it with the Kennedy's Villas folk, it must have been cold in that 1932 photo, they're all wearing heavy overcoats and several of them have scarves or gloves on. what site do you view the newspapers on, I was looking at one yesterday and it had a bit of info on my great Grannys sister and mother being assaulted by the sisters husband but of course it gives you half words and words that are spelt wrong etc but you get the gist of what it's about, you've to subscribe to view it properly but I found it abit expensive for me, was wondering if it's the site you use? Many thanks to Teap and CmcG and apologies for my delayed response. Harry Hanley promoted some famous boxing and wrestling tournaments in the Ulster Hall and the King's hall. Also he played a major role in introducing greyhound racing in Celtic Park - the first dog track in Ireland. A forgotten man.